Point-and-figure chartists forecast trading prices after a breakout by using the box count, either vertically or horizontally. However, vertical projections work more often than horizontal projections. In point-and-figure charting, you buy when the new price surpasses the highest X in the previous X column, and you sell when the new price surpasses the lowest low O in the previous O column. When the price surpasses a previous high or low, you have a breakout. Say that your security has just made a double or triple top breakout. You want to know how high the price will go. Or your security has fallen to a new low but is now rising up off it. You want to know the potential gain if the bottom is really in and the up move continues. You know that the price will retrace to the downside over the course of the move, and you don’t want to mistake a retracement for the end of the trend. If you have faith in the forecast, you decide to ride out the retracement. Find the bottom of the last X (upward) column if you have an upside breakout (or the bottom of the lowest X column if you suspect a reversal to the upside). Count the number of boxes in the column. Say you have four boxes. 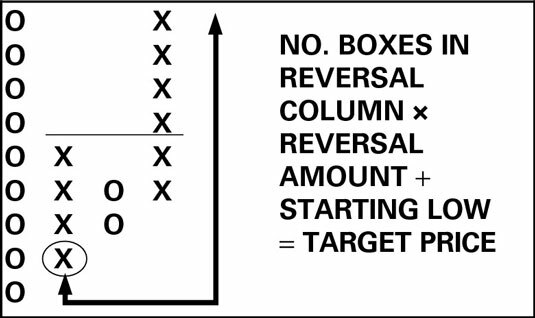 Multiply the number of boxes by your reversal amount, say the standard three. Multiply that product by the box size. Say you use the standard, $1. Add the product to the lowest low in the starting column to get your new price target. If the lowest low was $10, you add $12, and your price target is now $22. This figure shows a sample vertical point-and-figure projection. The price objective is only a guide. The actual new high may fall short of $22, or it may be a great deal more than $22. You don’t automatically sell at $22 if the price is still making new highs. But you may want to evaluate the risk-reward ratio in terms of the price projection (the reward) and the lowest low in the starting column (where you may place your initial stop). You use a horizontal count to project the ending price of a breakout after a period of consolidation. Say the price has been going mostly sideways for some period of time. Yes, it has alternating X and O columns, but your eye can detect a base, or bottom formation. This figure shows a base forming after a five-column downtrend ahead of an upside breakout. Identify the number of columns in the base, which is the sideways period before the breakout. Exclude the breakout column from this number. In this example, say you identify five columns. Multiply by the number of columns in the base by the reversal amount you choose. Say you use the standard three-box reversal. 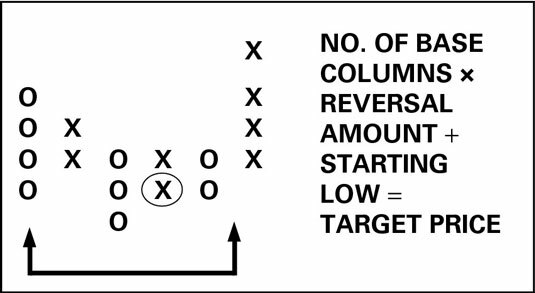 Add the product to the lowest low in the base to get a price target. Say the lowest low is $10. Now you have a price target of $10 + $15 = $25.